Thanks to Aberystwyth Arts Centre, Literature Wales and HAUL. I am sitting in the middle of a theatre while being served a French three-course meal by trapeze artists. My dining companion is an American phd performance student who researched Amsterdam prostitutes punting their wares in the windows of the red light district. The waiter is now hula-hooping in the middle of our table during the starter and our waitress has knotted her thighs in the climbing rope suspended from the girders. An hour earlier I was attending the talk by my fellow artists in residence who are also my housemates. In one video, my housemate Eeva Marie was being pelted with tomatoes like a medieval reprobate. Dinnertime at home will never be the same again. There are certain indicators that exclaim: ‘Dorothy, you’re not in Kansas any more.’ I am no longer surreptitiously scribbling poems during my day job in Bridgend. Instead I have a Heatherwick-designed work pod given to me explicitly for the purpose of penning such verses. I can’t believe my luck! Safe to say, my writer’s residency in Aberystwyth Arts Centre has unequivocally begun! Two days earlier, I was teaching my first creative writing workshop to the MIND mental health group. Two lovely ladies turned up, one of whom bogarted the airwaves for the entire two hours. It was a miracle, but I managed to crowbar two poems out of them. I also promised myself I would be stricter with quelling the verbiage the following week. As part of my residency, it is hoped that activities in the Arts Centre will inspire some verse. I am now sitting on the margins of a pre-school bilingual playgroup, surrounded by toddlers suckling on tambourines and chasing juggling balls. One girl is dressed as a bumblebee fairy. Reggae is playing in the background. I am starting to suspect the parents are having more fun than the bewildered infants. Surprisingly, I’m finding a poem is embroidering itself. The whole situation is too wonderfully surreal to ignore. The Arts Centre has been home to a poetry group for over twenty years, some of whom have been attending all this time. The group even organise trips and readings to the Poetry Café in London and recently ran a Coleridge evening. The first Saturday of the month, the group shares poems written internally. On the third Saturday, the group shares poems written by both famous and lesser-known poets, usually only revealing the poets’ identity at the end. I am quite in awe. In ten years of attending poetry groups and workshops, chiefly in London, never have I attended such a proactive group. I feel like a spy as I creep into the room. A poem is being workshopped. I ask for permission to unleash my critique, it is granted and I duly turn into the Simon Cowell of the group. At the end of the session, Nigel Humphries reassures me that I have not systematically alienated myself from the group and even says I have their full support for my planned monthly Spoken Word evening. I practically skip down the hill to watch the final half of Wales in the Six Nations Final. Wales Book of the Year contender Rhian Edwards on her residency at Aberystwyth Arts Centre, due to end next week. Her spoken word events included the highly successful Chinwag sessions with open mic, plus events with professional poets and authors from the university and locality, including Niall Griffiths & Damian Walford Davies. 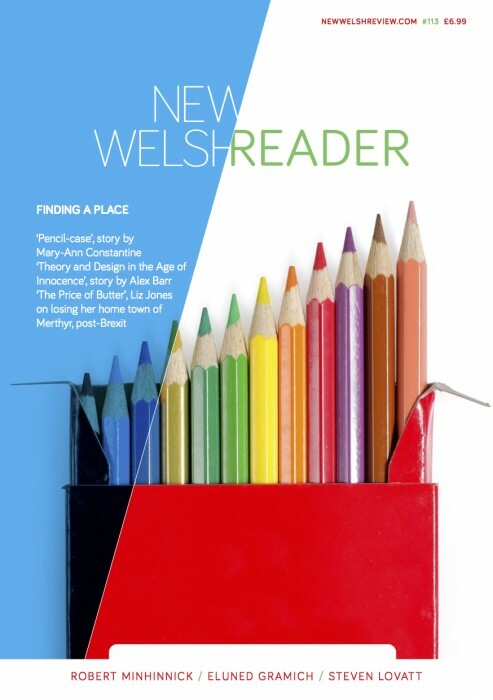 Rhian's story 'My Mary Jane' is published in NWR 100 this Saturday and will be performed by herself at a private party celebrating NWR's landmark hundredth issue at Hay Festival on 28 May, where Rhian will also perform the winning entry of the Flash in the Pen competition, seconds after the winner is announced.